We went down to the river in Rhode Island today. We were looking for Autumn and thought it might be hiding along the river in Lewis Bleiweis Park. It was or at least a bit of it was there. A few trees with red and yellow leaves and a giant pink shrub. The side streams were flowing very heavily and there were whirlpools in the river. Together, we took more than 300 pictures. 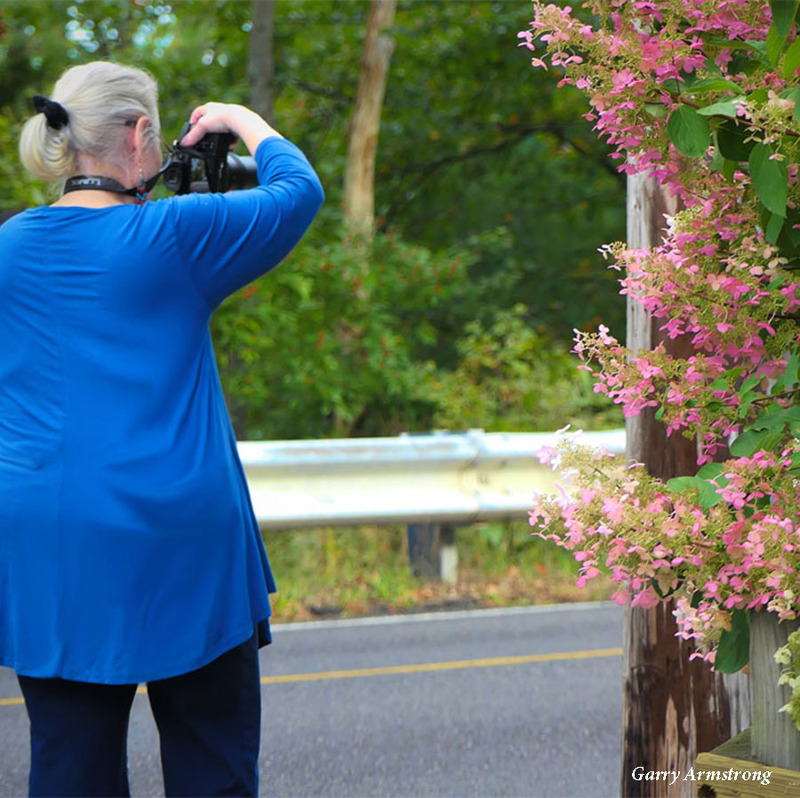 I took pictures of the pink bushes and Garry took pictures of me taking pictures of the bush. And we both took pictures of the river and the trees. More to come on those. For now, for this last night of September, it’s all about the pink shrub (no, I don’t know what it is but I’m sure someone will recognize it) and me and my camera. 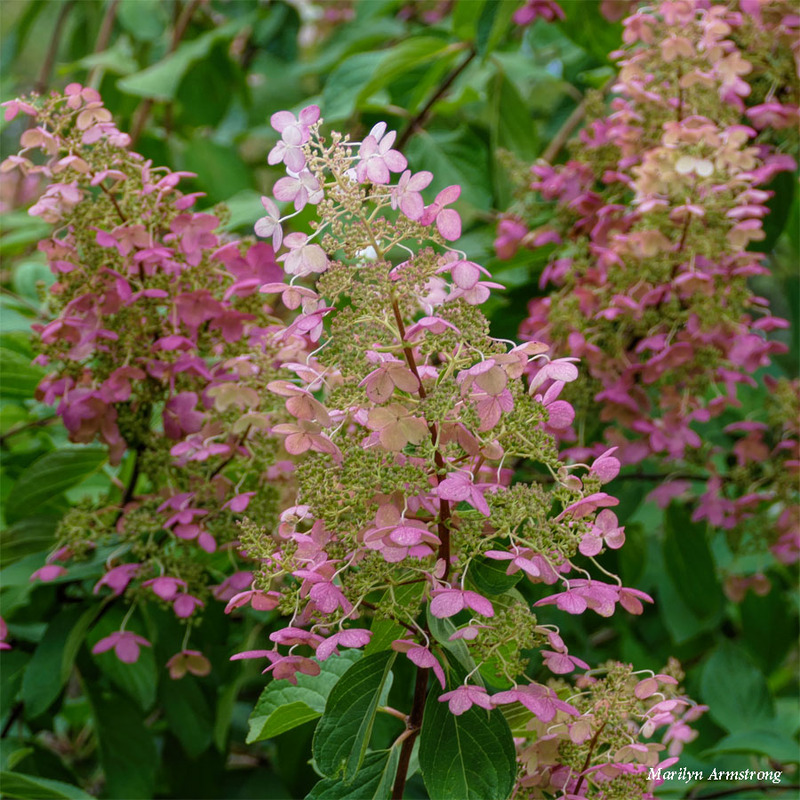 A lovely pink shrub — I didn’t realize there were flowers at this time of year to counter the green and fall colors! There usually aren’t. This is a strange year. In the Arctic, I would suggest fireweed, but that’s also a spring flower, and not a vine. I don’t think it’s a vine. I think it’s either a really BIG bush — or a tree. There were actually two of them in the garden patch, not one. I only shot that one. The other one was back-lighted and I didn’t think I’d get the color. But pink is NOT an autumn color. Looks like a climbing hydrangea, but I’ve not idea if such a plant even exists let alone its name!! I’ve never seen them either, but it didn’t look wild at all. 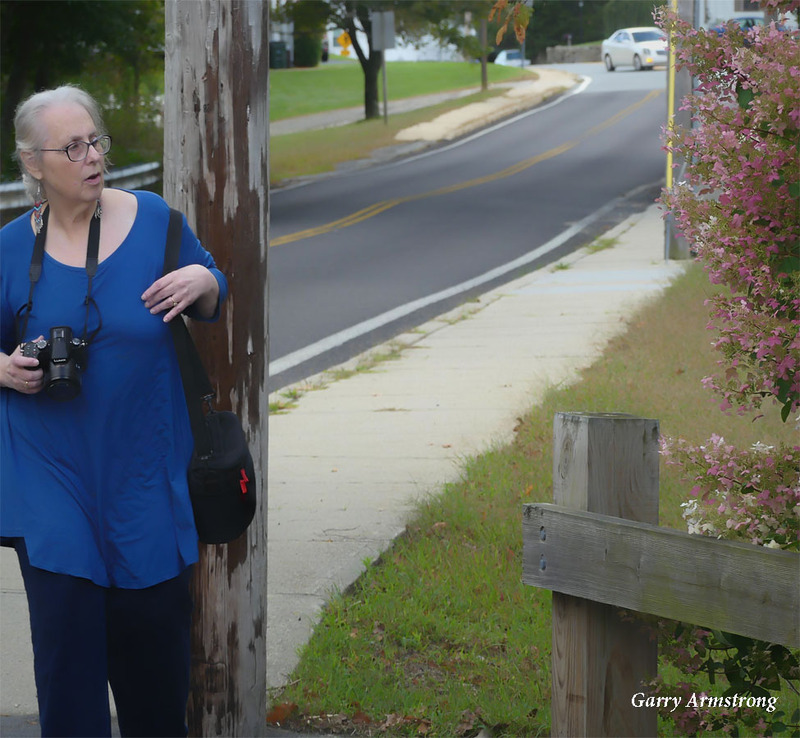 It looked like a mature garden shrub — or maybe it is a tree. Also, pink is not a color you see much in the fall, so it was an odd time for it to show up! It was pretty big. In size, at least as big as a well-grown lilac. But not a lilac. Never seen a pink shrub before. And the lady in the photo is also looking good. From a distance, I thought it was brown, but as I got closer, I realized it was pink (mostly) with white mixed in. As I keep saying, I’m sure it’s a garden plant, not wild. I just don’t know what it is. It was pretty big, too … at least 15 or more feet tall. 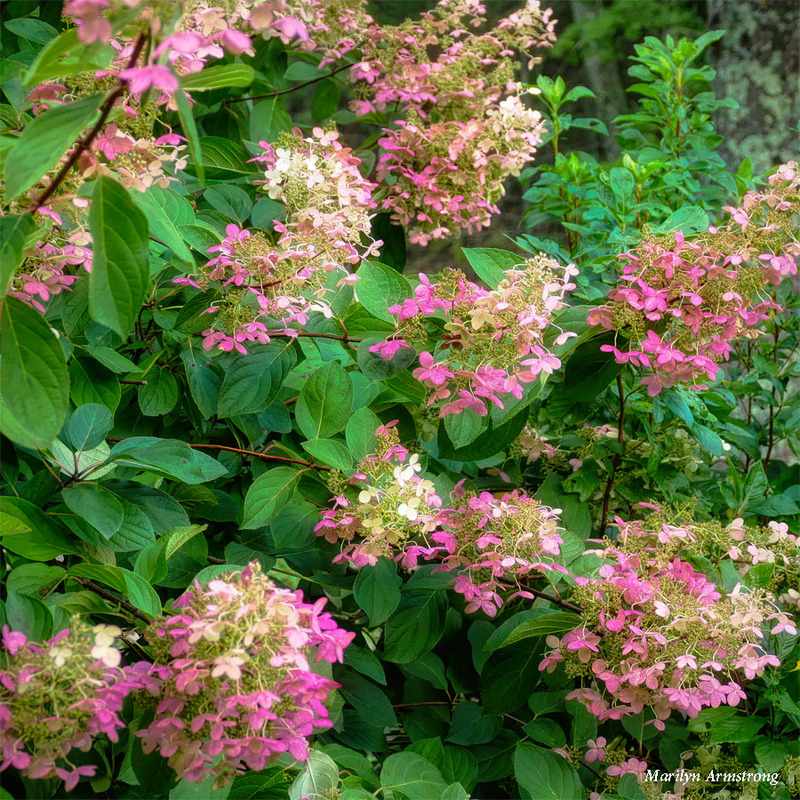 Sure looks like it … but why is it blooming in the fall in New England? Also, this was MUCH bigger. But the flowers do look the same. Thanks,, Cee 🙂 Now, if I could just figure out what kind of plant that is. I’m sure it’s a garden plant, not wild. Almost looks a bit like Lilac but it’s the wrong time of year for it. I sure hope someone knows what it is. Definitely not a lilac. I have several lilacs on my property and these are nothing like them. There’s a name for them, I’m sure. I just don’t know what it is. But I think this is a garden plant, not a wildflower. It was probably domestic at some point. It simply looks cultivated. But since I’ve never seen them around, they aren’t popular plants … and pink is a really odd color for autumn.